Lily Mae Martin is an artist, mother of a two-year-old, and nomad who after being based in Berlin has moved four times since her daughter Anja’s birth – from Cardiff, to Melbourne, back to Berlin, and most recently back to Melbourne. A woman before she has a baby is everything she is then she becomes a Mum and that is all that she is. Which isn’t true, Motherhood isn’t an end. It’s just change, a beginning. While I was pregnant I had no idea what to expect and I was afraid I would stop making art. 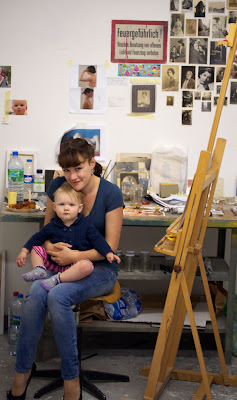 However when I became Anja’s mother I found a new and stronger voice- I realised that art was a great way to express everything about motherhood- the pain, the joy, the fear, the sleeplessness, the isolation. 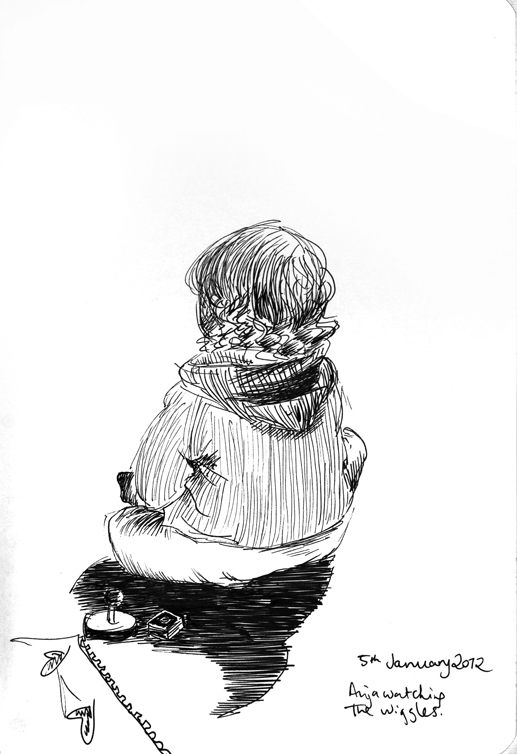 I decided to start Berlin Domestic as I needed to work out a new way for me to draw, a way I could draw when I was with my daughter. 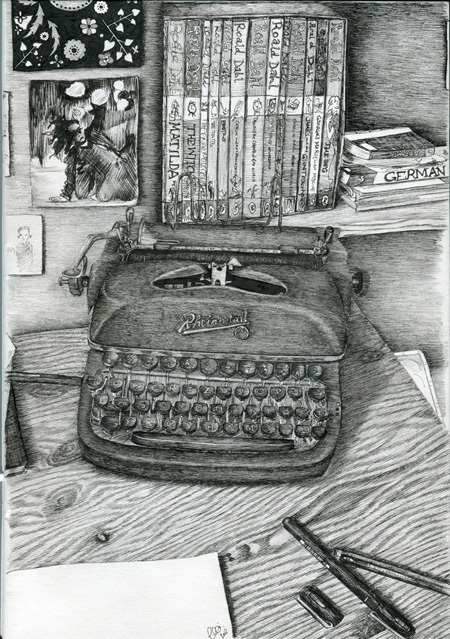 It also helps me because when I feel completely overwhelmed and utterly alone, I know that someone out there will read my writing and see my drawings and connect with it. My creative process is something I have been developing and refining for years. I’m mostly interested in drawing but lately I have been exploring painting and writing as well. Being an artist is tough, thereare a lot of set-backs and it`s very undervalued, but I enjoy it. After I recovered from Anja’s birth and could focus enough to read a book I read The Divided Heart. It was so interesting hearing about women so driven by their practices and a lot of them moving away from their families with a small child, like I ended up doing. I have to admit it took me some time to really understand the book. My baby was only a few months old and while I still managed to make some work I didn’t have any artistic demands. When we moved back to Berlin, when Anja was only 6 months old,thatwas when I began to understand the division. I had to fight to get time to make my work, to get the space to make my work.And I encountered more issues with this as well.Peoplewere seeing me as a singular entity and demands were being made on me to participate in things on a level that does not work when you have a kid. I thought; there must be a better way to do this, so I left my studio space and began working from home. As a family unit we’ve all learned to balance this, it took 18 months to work it out! I think MAN and BIG are great ideas and places for women to no longer feel alone. I struggled a lot with becoming a Mum and still being an artist. I felt a lot of the time Anja and Mothering wasn’t something I could bring up in regards to art things. I did a few interviews after having her where I don’t even mention anything about pregnancy, birth, babies, poo – you know, the things that my life mainly consists of now. So finding groups and networks that do talk about this is refreshing. Being able to connect with more parents who are artists is enriching. Being able to talk about concepts, paint, process and nappies, sleeplessness – it’s a lifeline. Bravery is… following your gut. Imagination is… crucial to a person`s development. Generosity is… being able to accept things, even if it is different to you. 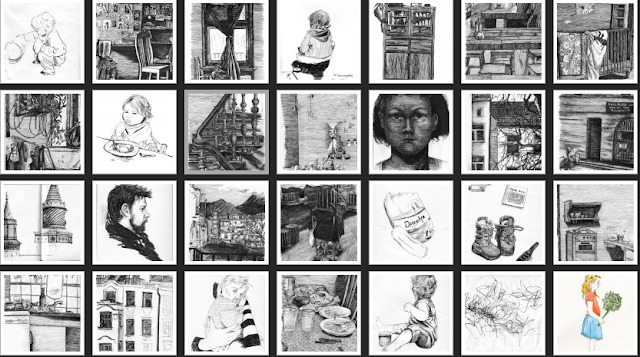 The Mother Artist Network (MAN) is an initiative of Jo Pollitt and Lilly Blue and BIG Kids Magazine. This inaugural mini MAN Festival has been curated in collaboration with guest editor and mother artist extraordinaire Vivienne Rogis to whom we are so grateful! The Mother Artist Network is a place that invites BIG ideas and discussion about creative practice and motherhood. Through a forum of ongoing blog posts the MAN will feature voices of mother-artists at all stages of artistic engagement and motherhood. We very much hope you will contribute to the conversation by commenting below or emailing us at info@bigkidsmagazine to add your story to the mix. 2019 © Big Kids Magazine, All Rights Reserved. Site by ALSO.